Now concerning the coming of our Lord Jesus Christ and our being gathered together to him, we ask you, brothers, not to be quickly shaken in mind or alarmed, either by a spirit or a spoken word, or a letter seeming to be from us, to the effect that the day of the Lord has come. Let no one deceive you in any way. For that day [the Day of the Lord] will not come, unless the apostasia comes first, and the man of lawlessness is revealed, the son of destruction, who opposes and exalts himself against every so-called god or object of worship, so that he takes his seat in the temple of God, proclaiming himself to be God. Do you not remember that when I was still with you I told you these things? And you know what is restraining him now so that he may be revealed in his time. For the mystery of lawlessness is already at work. Only he who now restrains it will do so until he is out of the way. And then the lawless one will be revealed, whom the Lord Jesus will kill with the breath of his mouth and bring to nothing by the appearance of his coming. The coming of the lawless one is by the activity of Satan with all power and false signs and wonders, and with all wicked deception for those who are perishing, because they refused to love the truth and so be saved. Therefore God sends them a strong delusion, so that they may believe what is false, in order that all may be condemned who did not believe the truth but had pleasure in unrighteousness. What Does “apostasia” Truly Mean? Let’s examine the word Paul uses to describe what must occur before the Day of the Lord arrives – apostasia. Often this word is translated as “falling away” or “rebellion”, but is that the correct meaning? And what is it a falling away from? Is it a falling away from the faith, as is so often assumed? Or is it a falling away from something else? Study Shows that only 10% of Americans Have a Biblical Worldview – While over 70% of Americans claim to be Christian, only 46% state they have a Biblical worldview. The American Culture and Faith Institute conducted surveys in 2017 to see how many Americans truly do have a basic Biblical worldview, and found the number to be closer to 10%. Barna Survey Examines Changes in Worldview Among Christians Over the Past 13 Years – The results of this study are astonishing – overall only 9% of Americans have a Biblical worldview, which is consistent with the ACFI study. Among those who identified as “born again Christians”, only 19% actually possessed a Biblical worldview. The results were consistent over the past 13 years, showing no statistical change. Berean Research – Ecumenicism in the Church – Link to articles by the discernment group Berean Research on Ecumenicism. Dictionary.com defines Ecumenicism as: “(Christianity) the doctrine of the ecumenical movement that promotes cooperation and better understanding among different religious denominations: aimed at universal Christian unity.” This might sound good, but it involves compromising critical core doctrines which are essential to salvation. Rise in Christian Persecution – Open Doors USA released a report in late 2017 that shows 215 million Christians are living with high levels of persecution for their faith. Over 3000 Christians were killed last year for their faith and 800 churches were damaged in targeted attacks. The full report can be downloaded here: World Watch List 2018. This is astounding for sure, and unprecedented in recent history. However, I would suggest that throughout the church age there has been ebbs and flows of marked persecution of true believers. This can be tracked in Foxe’s Book of the Martyrs. For further discussion on what Paul taught about the church in the latter days, please see: A Picture of the Church in the Last Days. The apostasia that Paul describes in 2 Thessalonians 2 is also associated with a specific event, and not a generic long-term connection. It also appears to usher in the Day of the Lord. Let’s keep in mind the record of Paul’s previous teachings to the Thessalonians. He had previously taught them that they would be spared from the wrath that was to come in the Day of the Lord. They knew they would be “caught up” to be with Jesus before the Day of the Lord began. The word roots of apostasia are “apo” – from, and “istemi” – stand. Dr. Thomas Ice suggests a more accurate translation of the word “apostasia” would be “departure” in both instances where this word is used in scripture. In 2 Thessalonians 2 apostasia would mean a departure, disappearance, or “away from” event, recognizable and at one specific point in time. What precisely does Paul mean when he says that “the falling away” (2:3) must come before the tribulation? The definite article “the” denotes that this will be a definite event, an event distinct from the appearance of the Man of Sin. The Greek word for “falling away”, taken by itself, does not mean religious apostasy or defection. Neither does the word mean “to fall,” as the Greeks have another word for that. [pipto, I fall; TDI] The best translation of the word is “to depart.” The apostle Paul refers here to a definite event which he calls “the departure,” and which will occur just before the start of the tribulation. This is the rapture of the church. So the word has the core meaning of departure and it depends upon the context to determine whether it is used to mean physical departure or an abstract departure such as departure from the faith. The first seven English translations of apostasia all rendered the noun as either “departure” or “departing.” They are as follows: Wycliffe Bible (1384); Tyndale Bible (1526); Coverdale Bible (1535); Cranmer Bible (1539); Breeches Bible (1576); Beza Bible (1583); Geneva Bible (1608). This supports the notion that the word truly means “departure.” In fact, Jerome’s Latin translation known as the Vulgate from around the time of a.d. 400 renders apostasia with the “word discessio, meaning ‘departure. '” Why was the King James Version the first to depart from the established translation of “departure”? Theodore Beza, the Swiss reformer was the first to transliterate apostasia and create a new word, rather than translate it as others had done. 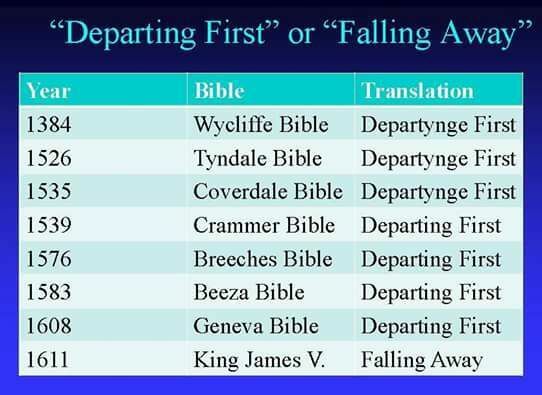 The translators of the King James Version were the first to introduce the new rendering of apostasia as “falling away.” Most English translators have followed the KJV and Beza in departing from translating apostasia as “departure.” No good reason was ever given. Since the Greek language does not need an article to make the noun definite, it becomes clear that with the usage of the article reference is being made to something in particular. In II Thessalonians 2:3 the word apostasia is prefaced by the definite article which means that Paul is pointing to a particular type of departure clearly known to the Thessalonian church. The use of the definite article would also support the notion that Paul spoke of a clear, discernable event. A physical departure, like the rapture would fit just such a notion. However, the New Testament teaches that apostasy had already arrived in the first century (cf. Acts 20:27-32; 1 Tim. 4:1-5; 2 Tim. 3:1-9; 2 Pet. 2:1-3; Jude 3-4, 17-21) and thus, such a process would not denote a clear event as demanded by the language of this passage. Understanding departure as the rapture would satisfy the nuance of this text. The apostasia that Paul is referring to is “our being gathered together to him”. All true believers will depart from this earth and be gathered together unto Christ in the clouds, and so forever be with the Lord! With the apostasia defined as a departure, Paul’s previous teachings on the catching up event are perfectly clarified. The Day of the Lord will not begin until the departure event has occurred – which Paul calls here “the coming of our Lord Jesus Christ and our being gathered together to him”. Note that this “coming” is a revealing – Jesus is revealed in the heavens and calls us up to be with Him. Let’s now examine the second event that Paul teaches must occur before the Day of the Lord can come. For that day [the Day of the Lord] will not come, unless the apostasia comes first, and the man of lawlessness is revealed, the son of destruction, who opposes and exalts himself against every so-called god or object of worship, so that he takes his seat in the temple of God, proclaiming himself to be God. Do you not remember that when I was still with you I told you these things? And you know what is restraining him now so that he may be revealed in his time. For the mystery of lawlessness is already at work. Only he who now restrains it will do so until he is out of the way. And then the lawless one will be revealed, whom the Lord Jesus will kill with the breath of his mouth and bring to nothing by the appearance of his coming. The coming of the lawless one is by the activity of Satan with all power and false signs and wonders, and with all wicked deception for those who are perishing, because they refused to love the truth and so be saved. From a straight, literal reading of the text, we can see that there is a man of lawlessness who will be revealed before the Day of the Lord begins. From supporting passages, we can determine that the Lawless One is clearly the future Antichrist. We discussed this in Part 2 of our study: Part 2 – The Restrainer and the Restrained in 2 Thessalonians 2. Note that the word used in the Greek interlinear for “revealed” is parousia [Strong’s 3952]. I hope you recognize that word from our study on the revealing of Jesus Christ! This word can mean presence, a coming, an arrival, an advent, or a visit. It has associations with visits of kings or other high ranking officials, which is interesting in that the antichrist seems to arise as a king in the fourth kingdom, foretold to Daniel through a dream thousands of years ago. Will the man of lawlessness be revealed as a Conquoring King, according to Jewish Messianic expectation? It seems very likely. For further study on this topic, see Triumph: The Beast (Antichrist) Rises to Power. How is the Man of Lawlessness Revealed? The man of lawlessness will be revealed only when God chooses to allow him to be revealed. Paul now reminds the Thessalonians that although the the mystery of lawlessness is already at work, the revealing of the specific “man of lawlessness” is being restrained. We know that satan is certainly chomping at the bit to reveal his “man of lawlessness”. He is, after all, the ruler of this present world (Ephesians 6:12). But he cannot, until the fullness of time. It is God alone who appoints a time for everything. The Day of the Lord cannot begin until this man of lawlessness is revealed. Commonly, people teach that the antichrist will be revealed at the event known as the “abomination of desolation” at the midpoint of Daniel’s 70th week. Is this assumption correct? I encourage you to read our passage again without any preconceived notions. What will reveal the man of lawlessness? The Thessalonians should already know from Paul’s previous teachings what is restraining the man of lawlessness (Do you not remember when I was with you I told you these things?). The mystery of lawlessness is already at work, although he who restrains it will do so until he is out of the way. There is a WHAT that is restraining the man of lawlessness, which is the same as a HE who is restraining the mystery of lawlessness. Put another way, there is a HE [the lawless one] that is being restrained by a WHAT [the body of Christ, indwelt by the Holy Spirit], and a WHAT [the revealing of the lawless one, the full mystery of lawlessness] that is being restrained by a HE [the Holy Spirit]. The presence of the body of Christ, indwelt by the Holy Spirit, is currently restraining the man of lawlessness. The Holy Spirit is restraining the full expression of the mystery of lawlessness and will do so until He is taken out of the way. 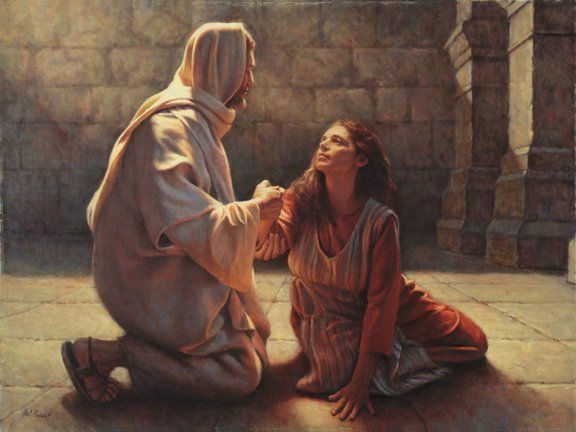 We discussed this more fully in this post: Part 2 – The Restrainer and the Restrained. This revelation will involve a spectacular display of supernatural signs and wonders, driven by satan himself. I am sure it will be very convincing. Part 4 – The Wicked Deception – “Aliens”?. Please also see this discussion about the Jewish Messianic expectation, which I believe the anti-messiah will try to appear to fulfill: Why Israel Rejected Jesus at His First Coming. This revelation may also include a re-confirming of the Mosaic laws, or perhaps land and peace treaties. Those possibilities are discussed more fully here: The Covenant With Israel – Who Confirms It? The revealing of the lawless one, with the deceptive signs and wonders, will specifically be allowed by God because those left behind after the rapture “refused to love the truth and so be saved” through the catching away event. Believers will not be sent a strong delusion from God, because they believe the truth. There is only one point in human history when there will be no believers on the earth – immediately upon the gathering together of the saints into heaven. And this is exactly when satan’s deception will be revealed with God’s strong deluding influence supporting it. Yes, the antichrist will have to rise to power and at the midpoint of Daniel’s 70th week will seat himself in the temple and declare to be “god”. However, that comes long after the event that triggers his revealing. Part 4 – The Wicked Deception – “Aliens”? This is exactly confirmation on what I was picking up on as well. WE the Christian church are the restrainer on the Anti-Christ. I watched the movie Left Behind (2000) and this one part really stood out to me… the main character finds out that after all these strange disappearances worldwide that “The President is missing.” And I had an “AHA!” moment of revelation. President Trump and Vice President Mike Pence are going to be raptured and all the Christians they have in the White House that have been hosting bible studies and prayers… I think that Jared Kushner IS the Anti-Christ. I think Trump is fulfilling God’s Will and while being well-intentioned in his favor of Israel and Judaism might overlook the fact that he’s putting his son-in-law in charge of the Israel Peace Deal and his son-in-law does NOT believe in Jesus as the Messiah. Jared Kushner purchased building 666 5th Avenue for over 1 billion dollars and the company that shares the building with him is LUCENT Enterprise which manufactures the RFID microchips. And Jared’s brother, Joshua Kushner, works for an insurance company that uses Obamacare to put these microchips in people “for health reasons”… but Trump et al seems really excited about Israel and Technology advances. I just can imagine Jared makes this Peace Treaty and then all the Christians are raptured which would pave the way for him to take over as leader of the United States and pushing for this microchip to be worldwide. I mean… redflag when the company that shares a building where he lives AND his brother are connected to benefit financially by the chip… and his father-in-law is putting him in charge of peace deals with Israel and he doesn’t believe the Messiah has come yet. And with the building 666 address you have the connection to that number. I think he’s also part of why Trump always flashes that sign when he talks. I never saw Trump do that prior to campaigning for President and Jared Kushner kept being harolded as the biggest help behind Trump being elected. He may perhaps be involved in Jewish mysticism, Kabbalah and therefore be knowledgable on numerology therefore using 666 as a power number. But yes, I really think we will be raptured PRE-trib just like Noah was spared the flooding of the earth.